Acho que tenho comido cerejas todos os dias mas ainda não tinha feito nenhuma sobremesa com elas este ano. Decidi fazer um Floresta Negra como eu gosto: com cerejas frescas. I have been eating cherries every day but hadn't done any dessert with it this year. 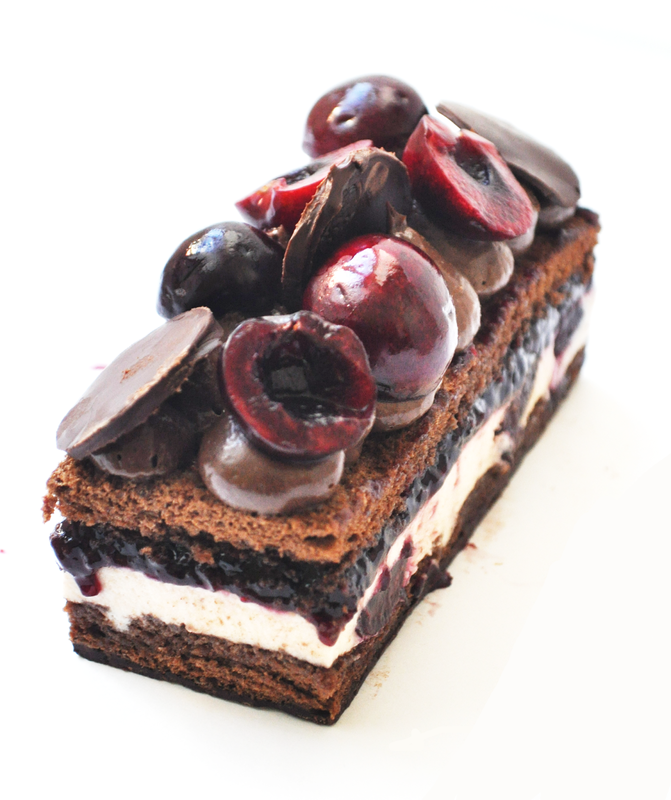 Here´s a Black Forest as I like: With fresh cherries. Para o biscuit, bater as gemas os 80gr de açúcar até duplicarem de volume e ficarem esbranquiçadas. Bater as claras com os 50gr de açúcar. Envolver as claras batidas nas gemas. Adicionar a farinha e cacau peneirados. Colocar o preparado em formas de igual diâmetro e levar a forno pré-aquecido a 190º durante cerca de 15 minutos. Para a mousse de chocolate, misturar as gemas com o açúcar. Ferver as natas e o leite. Verter sobre as gemas. Fazer um creme inglês, mexendo sempre em lume brando até atingir os 82º. Verter sobre o chocolate partido em pedaços. Passar a varinha. Refrigerar, com película em contacto, durante a noite. Para a compota, ferver o açúcar com a água. Juntar as cerejas e ferver por 15 minutos. Para o creme de Kirsch, fazer um creme inglés com as natas, gemas e açúcar. Colocar a gelatina previamente hidratada. Deixar arrefecer num banho de gelo. Envolver as natas batidas. Adicionar as cerejas. Coloque o primeiro biscuit num aro metálico. Colocar o creme de kirsch e congelar. Quando estiver sólido, colocar a compota de cereja e colocar o segundo biscuit. Cobrir com a mousse de chocolate e cerejas frescas. For the biscuit, beat the egg yolks 80g sugar until doubling in volume and become whitish. Whisk the egg whites with 50g of sugar. Involve the stiff egg whites into the egg yolks. Add the sifted flour and cacau. Place in molds of the same diameter and lead to preheated oven at 190º for about 15 minutes. For the chocolate mousse, mix the egg yolks with the sugar. Boil the cream and milk. Pour into the egg yolks. Make an English cream, stirring constantly over low heat until it reaches 82º. Pour over the chocolate broken into pieces. mix with the wand. Refrigerate with cling film in contact overnight. For the compote, boil the sugar and water. Add cherries and simmer for 15 minutes. For the cream Kirsch, make an english sauce with the cream, egg yolks and sugar. Add the previously hydrated gelatin. Allow to cool in an ice bath. Involve the whipped cream. Add the cherries. Place the first biscuit in a metal ring. Place the kirsch cream and freeze. When solid, spread the cherry compote and cover with the second biscuit. Frost with the chocolate mousse and fresh cherries. as tuas sobremesas são sempre bonitas!